The architectural practices IND and Powerhouse Company, both with branches in Rotterdam, have created an imposing icon. The media tower combines a technical function with recreational opportunities for a broad public. ABT did the structural drawings. The location on a mountain top with an open route to the sea meant high wind forces had to be contended with. The environment also posed stringent requirements on the structural design. In addition, there are various fault lines under the surface, which literally run along the dividing line between the European and Asian continents, resulting in high seismic risk. A parametric design model was of great value in the design process. The model provided understanding into the consequences of design choices for the structure. It is possible in this way to optimise construction within the structural and technical design limitations. The ends of the path merge into two vertical sections, forming an elegant gateway adjoining the media tower and offering visitors access to the site. A clear dividing line has been drawn in the design between the visitors' centre and the media tower. Any risk from radiation to visitors and staff in the visitors' centre has been avoided by this means. The Çanakkale Antenna Tower is situated on a forested hilltop. A raised path curves around the site, offering breathtaking views over the historic city and its surrounds, set off against the spectacular height of the media tower. The woodland can develop into an uninterrupted landscape under this raised path. Within the ring formed by the path there is room for a relaxing garden. 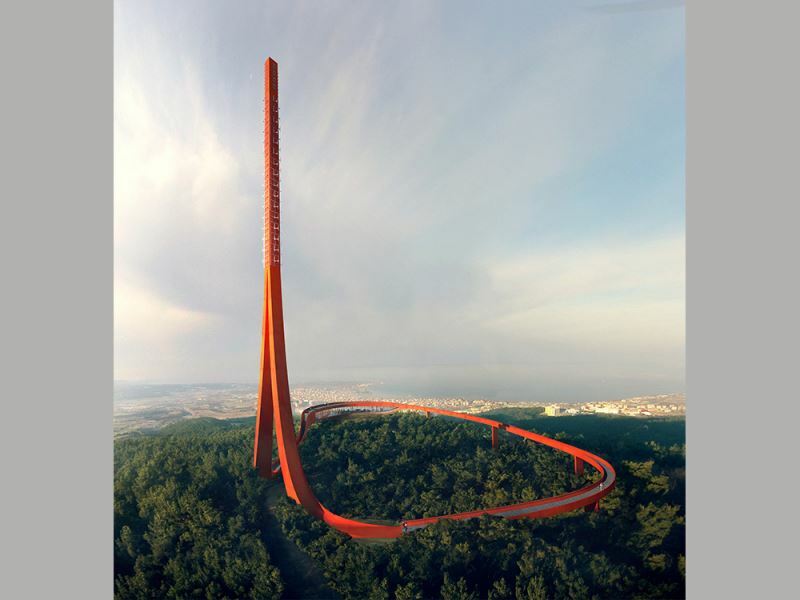 IND, Powerhouse Company and ABT have won a prestigious prize with their design for the observation and media tower. For the contest, eight international teams were short-listed to submit their designs for the tower.